Looks: He is a black Night Fury, with yellow eyes and claw-like red markings on his scales over his eyes. He also has a red dash on each front paw just along his shins, and two red stripes on his tail. Ice: The cold slows his bodily movements and he absolutely hates the cold, doing all in his power to avoid it. Weak Reflexes: In close combat, he is not skilled at all and may sometimes dodge into the blow, like trying to dodge a punch but actually smashing into it instead. 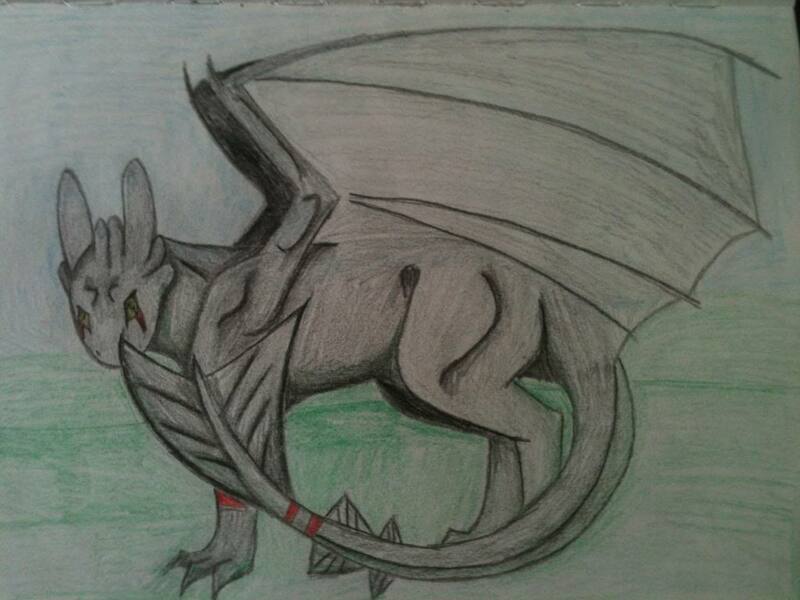 Smaller: Being a Night Fury, he is physically weaker than most other dragons. While he could over power a human or something similar his size, anything bigger is a challenge at the very least. Personality: Shudaar can be a goof, easily getting into trouble when he should know better. He has a tendency to take things that do not belong to him, especially if they are shiny or tasty. It is most likely the cause of his curiosity with how things are, and he becomes over familiar with strangers. That is, of course, as long as they do not threaten him or his owner. He is very loyal to his owner, and will obey them, able to understand them even if he cannot speak to them. When with strangers for the first time, Shudaar will be wary of them, but once they prove to not be a threat (which may be 5 seconds of petting for him), he will like them maybe a little too much. History: Born into captivity of outlaws, Shudaar had to fend for himself and learned early the ways to hunt for food, starting with mice and fish. When a group of bounty hunters came and annihilated the outlaws, Shudaar hid and remained unseen, following the bounty hunters back to a city not knowing what else to do. It was there he came into a fruitful relationship with a simple milkman. Shudaar learned that the two legged liked the green paper, fighting over it sometimes, and that nice things happen when giving it to others. It was when he 'borrowed' some milk, having never tasting it before and loving it, that he was caught by the not so happy milkman at the time. Long story short, the milkman gave Shudaar milk every time he brought him green paper. Having no concept of money, the milkman made quite a bit sometimes, and other times not much at all. Shudaar would be given about a 2 quarts of milk per visit and giving the man money, no matter what he brought. Sometimes it was only a dollar, other times a twenty, or even a hundred. By giving the milk with no relevance to the cash, the milkman lost some money when Shudaar brought only a single dollar, but it would quickly be made up when he brought a bigger amount of green paper. The most the milkman has made on giving Shudaar milk was $153, not a bad sale price for a couple of quarts of milk. 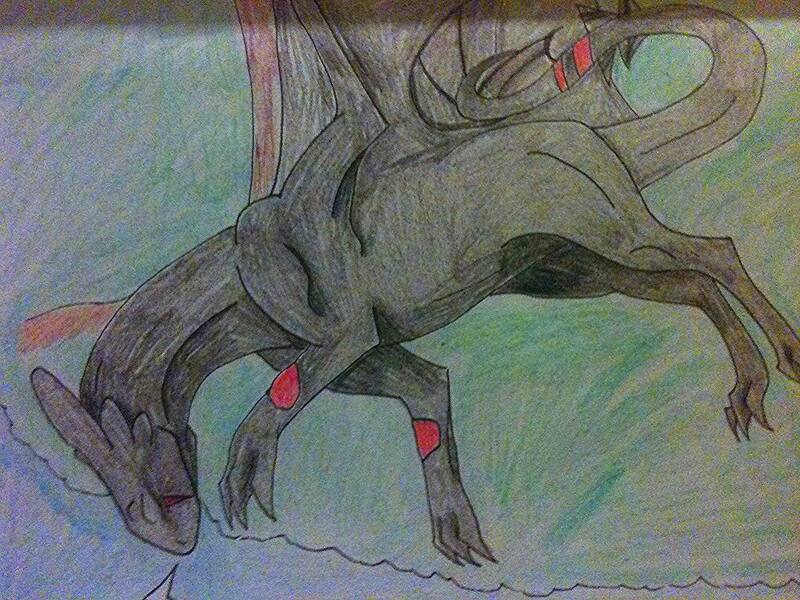 Fast and agile: Being a Night Fury, he is extremely quick and agile, able to move stealth-fully and quickly. Average flight speed is 100 mph, where with effort, can reach 150mph in horizontal flight. Max dive speed is 300mph. Electrical Conductors: While not the worst, it does make controlling electricity the way he wants it much harder. Special Abilities: Master of manipulating, redirecting, and creating lightning. He is exceptional with lightning and electrical based attacks, and can even take over other electric based attacks from other users. Attacks: He can generate a high enough voltage to act as a taser and stun the opponents, lasting a couple seconds after the shock like a regular taser, hence being called a stun type of attack. Heya ShuShu! I just want a few more clarifications with your dragon before I can re-approve him. Shudaar wrote: Fast and agile: Being a Night Fury, he is extremely quick and agile, able to move stealth-fully and quickly. Could you also just explain how he is a master of redirecting electricity, as I'm curious to know if he can use this redirection to be able to manipulate thunderstorms and whatnot, as this is rather vague. Can you please put down examples of what he can and can't do? With your taser zap, how long does that last and how many times is he able to use it and what are it's limits? Also, with your blood electricity, would he be able to use that against someone who doesn't use electricity? What are it's limits and strengths? Despite the movies and whatnot making it seem like he hits the speed of sound, I kept dive speed under half that. Redirecting is another fancy way for saying he controls the lightning and can move it. If it is electrical based, he can move the electrical part. Taser zap....lol. Just wordplay in basically saying zapping someone with Lightning. Not really a taser per say, but any shock could be considered a taser. I'll redo the review then, my apologies. 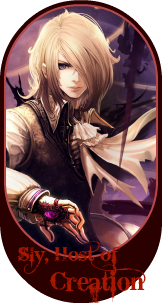 Tell me, in your app by editing it, what sorts of things he can create. Can he make a lightning storm out of thin air? If so, how large would the storm be, does his abilities cause him to be fatigued? Shudaar wrote: Attacks: He can generate a high enough voltage to act as a taser and stun the opponents. I would like you to say how long the stun lasts for, and how often he is able to use it. Also, how far can he zap? Please make the changes in your app. Shudaar wrote: Blood Lightning: Used on any electric-type enemy, it corrupts the electrical power inside the user, and when they try to use an attack with electricity, it will detonate just outside the body. Using this is very draining on Shudaar, and the bigger the target, the more energy drained. I need you to tell me, in your actual app, if he can use it on a person who doesn't have electric based attacks and what would happen to them if he did use it. I also need you to add limits on your character, as no one should be without limits. Also, add a few flaws to your characters personality in the 'weaknesses/flaws' section as all I see there are weaknesses for your character. Master of manipulating, redirecting, and creating lightning. He is exceptional with lightning and electrical based attacks, and can even take over other electric based attacks from other users. Even if this is only available when Shudaar becomes an adult, the sheer potential of it is massive. No matter what, lightning travels extremely fast and not many is going to survive a single bolt. Being able to manipulate and even CREATE lightning already puts Shudaar into the overpowered range. Any sort of enemy, he can just create lightning and strike them where they stand, resulting in an instant kill. There's no specified limit to how frequently he can create lightning or how taxing it is to his energy. Additionally, there were no specified cooldowns. Also, due to the extreme calibre of your ability (manipulating and creating lightning), I am going to ask that you provide a detailed description of how he can manipulate them rather than providing a general statement. Another problem with this ability that just came to my attention is that you can manipulate lightning from other characters. While it was allowed back in the old TB, and the first revamp of the new TB (when dragons were decided to be overpowered), dragon strengths have been lowered considerably to not give already existing dragons too much of an edge against newer members. Therefore, this ability needs to be changed, as it also crosses the boundary of what is considered powermodding as you are manipulating the other characters lightning. You are more than welcome to redirect the enemy lightning once it is fired towards Shudaar if you are considering keeping some aspect of it. Again, this is powermodding the other character's abilities. When making abilities, we are striving to make the characters as fair as possible. Being able to manipulate the other character's abilities and such can be considered highly unfair and can result in a lot of arguments. Although we do permit some abilities that powermods, these abilities are judged harshly. As a suggestion, only make abilities that affect your own character. Beyond that, the nature and description of this ability is incredibly vague that I do not see why this has been approved in the first place. There's no indication as to how blood lightning reaches the enemy (I am assuming it is telepathically), cooldowns, or severity of the explosion, or even if it can affect multiple enemies. Changing these abilities may be a better approach as there is a lack of lightning users currently on TB. *Changed weakness from conductor to not agile. Note, he is solely a lightning user, a specialist per say. Not diverse with multiple abilities. I would say this seems alright now, unless another staff says otherwise. Manipulating: Electrical energies that are non biological are capable of being controlled/manipulated. This includes natural and artificial energy. To control it, however, it has to be 'exposed' per say, or he has to have a way to get to the energy source. Energy cannot be ripped out through concrete or metal of a structure for example, unless an opening to the electrical system is available. Taking this into consideration, Shu can be capable of ripping power off the grid if he is near a powerplant and send a whole city into a blackout. You will need to make changes and ensure that it is clear that he cannot do this. Additionally, I have received word that you did not follow the changes which Lexia has discussed with you. Unless she is perfectly happy with it, I cannot officially approve the app. Note, a consensus with the staff team is required for characters to be approved, not just the opinion of one person. We are sorry for the inconvenience. Like we asked, so go ahead.